Martinez, M.; Martí, V.; Gimenez, F.
Excess of natural and synthetic fertilizers applied to agricultural soils is a well-known source of contamination of nitrates and potential source of contamination of metals (copper and zinc) and phosphates (Alloway 2010). Mineral phases such as iron oxides, are present in agricultural soils and they might play a main role in the retardation of the transport of different contaminants (Giménez et al. 2007). The present communication shows the experimental study of sorption of phosphate and zinc onto magnetite (Fe3O4) and hematite (Fe2O3) in order to investigate the role of these oxides as potential attenuating phases to incorporate contaminants when fertilizers are used. 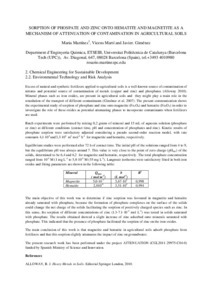 Martinez, M.; Martí, V.; Gimenez, F. Sorption of phosphate and zinc onto hematite and magnetite as mechanism of attenuation of contamination in agricultural soils. A: Mediterranean Congress of Chemical Engineering. "3th Mediterranean Congress of Chemical Engineering. Chemical Engineering in the 21st century, Barcelona, 30 September-3 October, 2014: book of abstracts". Barcelona: 2014, p. 238-239.